Google Earth image with historic photo overlay, USCG Ft Pierce, Fl. Taken from Todd Thurlow’s Time Capsule Flight. It’s fun when a blog blossoms into more! My recent post of the historic US Coast Guard station in Ft Piece was one such post…Thank you for the many wonderful comments and insights. Also, Dr Edie Widder is going to have the historic photos printed and hung at ORCA, located in the building itself. Talk about full circle! As a follow-up, my brother Todd created a “time capsule flight” of the Ft Pierce USCG Station and the Lake Worth station using the historic photos shared by Tim Dring, President of the U. S. Life-Saving Service Heritage Association. Mr Dring had recently shared the photos (discovered in the National Archives) with my mother as she is writing a book on the subject. My brother’s time capsule flight will take you from the St Lucie River/Indian River Lagoon proper to the Ft Pierce Coast Guard Station, and then jet-off to Peanut Island’s Lake Worth USCG Station. It is wild to see the what our area looked like undeveloped. I have to say although they are invasive, I miss the tall Australian Pine Trees. I can still hear them blowing in the Trade Winds. Such a romantic time it was….Have fun. Wear your seatbelt and don’t lean too far out of the Cub! 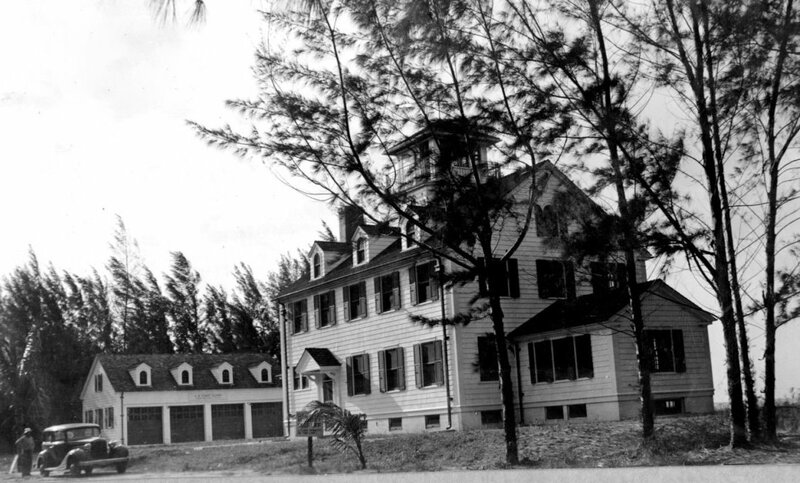 Link to THEN AND NOW, US COAST GUARD STATION FT PIERCE AND LAKE WORTH, Todd Thurlow. Also I am going to include a “funny story” about the “boys of the USCG” in Ft Pierce during WWII sent to me by family friend Stan Field, whose pen name is Anthony Stevens. I just read your post about ORCA and the old CG station and thought I would share this tale with you. My mother, Emmy, shared this family legend many times. She was a teenager during WWII. A true story about telephone Operations during WWII. My mother and her friends, worked as telephone operators during most of the war. In those days, that involved a headphone and a bank of ¼” phone jacks with cables and plugs. There were no automatic dialing systems. Every call was placed manually via party lines with anywhere from four to a dozen phones on each line. Now Emmy and her fellow operators were usually pretty bored and would stay ‘on the line’ when there were military conversations. One night, a very young and very ‘cool’ fellow that everyone loved for his sense of humor, was stationed at the Gilbert’s Bar House of Refuge. A call came into Emmy’s switchboard and she was asked to patch in to the House lookout station. Now all of the watchtowers along Hutchinson Island were on the same party line. When it rang, everybody picked up. The person on the other end asked for the station they wanted and that station would respond. Normally, as soon as you realized it wasn’t for you, you would hang up. “THANK GOD!” And he hung up. The sound of loud laughter flowed from a dozen headsets that were listening and the Captain hung up in fury. The next day, the Captain passed the word that the person who answered had better confess or the entire post would lose liberty the following weekend. Even though everybody on watch that night knew who it was, NOBODY stepped forward and they all were restricted to barracks that weekend. Needless to say, the young man was a model sailor for the rest of the war… and he owed each of his buddies a great deal. Tales for the 21st Century! Ft Pierce USCG station ca. 1930/40s. National Archives. Tim Dring via Sandra Thurlow. 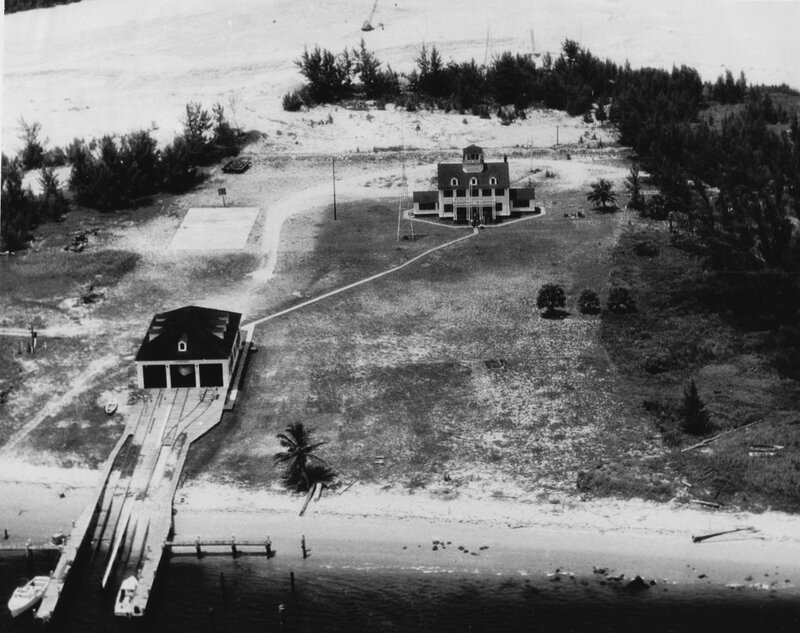 Lake Worth USCG Station 1951, Peanut Island, National Archives. Tim Dring via Sandra Thurlow. So after reading my blog, my mother sends me this awesome historic real estate ad above. Can you believe it? I had heard the tales of “urban legend” for years, but now there is a visual of this historical record! Thanks mom, for another amazing piece of history! 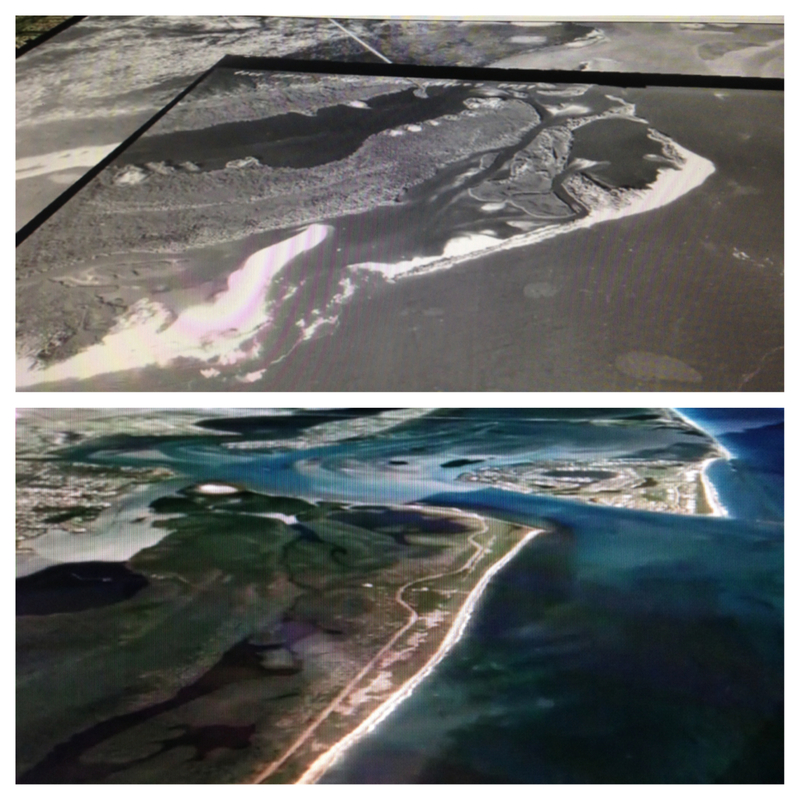 Contrasting images: Port St Lucie area along North Fork of St Lucie River, 1958 US Government aerials and Google Earth today. Courtesy Todd Thurlow. It is an amazing thing to fly through time and space, and this is exactly what I did yesterday with my brother, Todd. 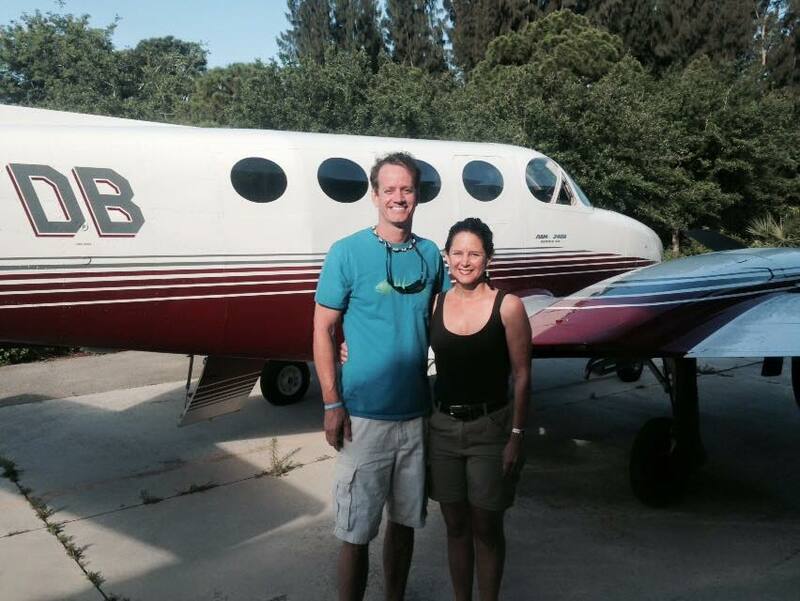 He took me on a “flight” over a 1958/Today St Lucie River, North Fork, and Ten Mile Creek. All the while, the images flashing in and out of past and present….Please watch this short video yourself by clicking the link or image above. 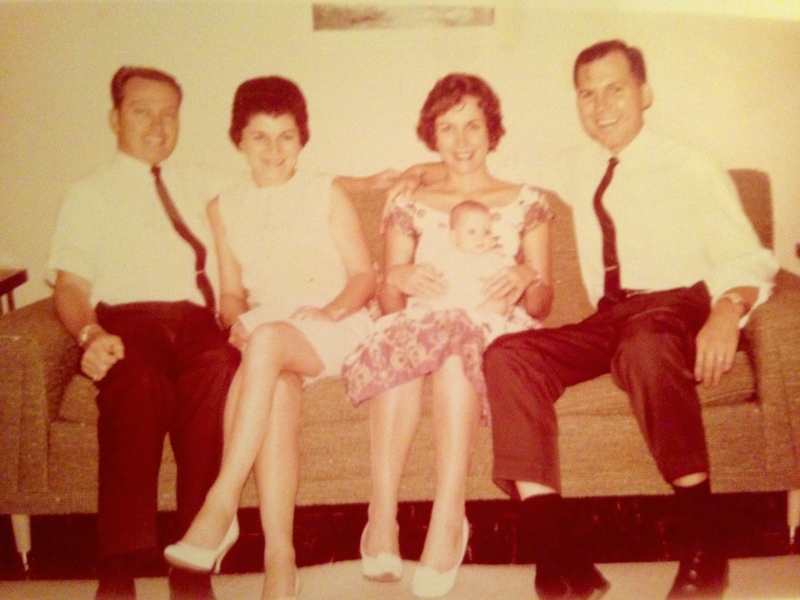 At one point along our armchair journey, I said to myself, “Wow, I don’t feel so great,” –just like sometimes when I am with Ed, my husband, in the airplane. I actually got motion sickness having plastered my face right up to the screen to see every moving detail! A few deep breathing exercises put the feeling off, but next time I’ll take my Dramamine! Google Earth image at the northern reaches of what was Ten Mile Creek in St Lucie County. Algae in agriculture canals is very visible. This flight, as the others you may have experienced on my blog with Todd, is amazing. 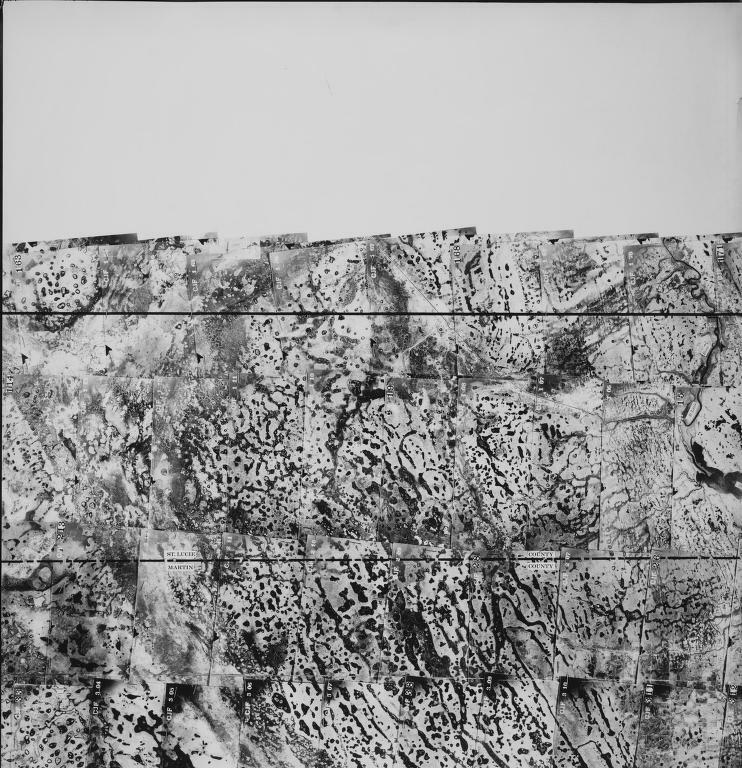 It allows one to really see what the lands were originally like and how they have been developed as residential homes and endless agriculture fields. 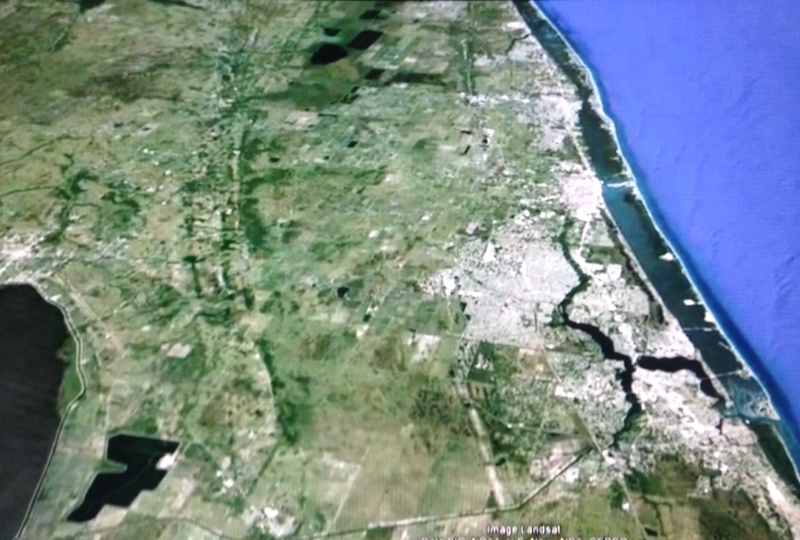 Towards the end of the video, you can even see algae growing in the agriculture canals, off of Ten Mile Creek, St Lucie County–“bright green,” for all to see on Google Earth. I have witnessed these green canals too from an airplane. Due to drainage canals— leading to drainage canals—leading to drainage canals, this water from the ag fields, and from all of our yards, ends up in the now sickly St Lucie River. This problem is exacerbated by ACOE/SFWMD releases from Lake Okeechobee and the basin area of C-44 in Southern Martin County. These canals and the expanded engineered runoff from the lands is what is killing our river. It is my hope that with visuals like the video above, future generations will find a way, and want to be a part of a new water and land management generation “seeing” how to improve St Lucie River/Indian River Lagoon. Our generation seems stuck in a quagmire…. Like they say: “seeing is believing,” and seeing provides insight for change. Northern reaches of the North Fork of St Lucie River, Ten Mile Creek in St Lucie County, 1958. Wetlands showing multiple small ponds are visible. These lands were drained in the 1950s by canals C-24, and further south C-23 and further north by C-25. These canals were part of the USACOE and SFWMD’s effort for more flood control and to expand agriculture and development: These canals are part of the Central and South Florida Flood Control Project of the 1950s which allowed more non flooding development and agriculture, but also destroyed our valuable south Florida waterways. *The yellow lines are today’s roads for reference; 91 is the Florida Turnpike built in the 50s and 60s. Topographical 1823 U.S. Army map, courtesy of Todd Thurlow. Meaning “alligator waters” by the Seminoles, these lands/waterways were traversed for centuries in hand-made canoes. The native people and the Seminoles traveled many miles through the St Lucie River/Indian River Lagoon, and during rainy season they could travel all the way up into the St Johns River. How? 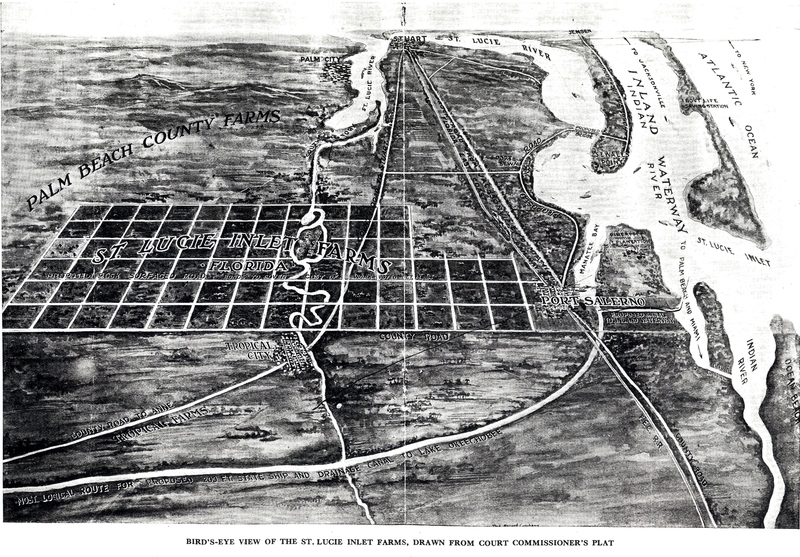 Because these lands, when flooded, were “connected.” Now they are not only no longer connected but water that flowed north into the St John’s flows south into the St Lucie River…. Back to Port St Lucie….. Recently, I kept noticing that the 1856 “Everglades” Military Map I like so much showed an expansive swamp close to where Port St Lucie and western Martin County are located today. Below you’ll find an edited version of Todd’s notes to me. I find all of this absolutely fascinating, and sometimes a bit unsettling….The natural ridges in the land we seem to ignore; how we blew canals through them; how the water USED to flow; how humans have developed and built agricultural empires, and changed everything….Maybe one day with visual tools like these, future land planners, and water district employees can change back some of our landscape to it’s former glory, and maybe even return a few gators to the landscape, since it’s named after them. 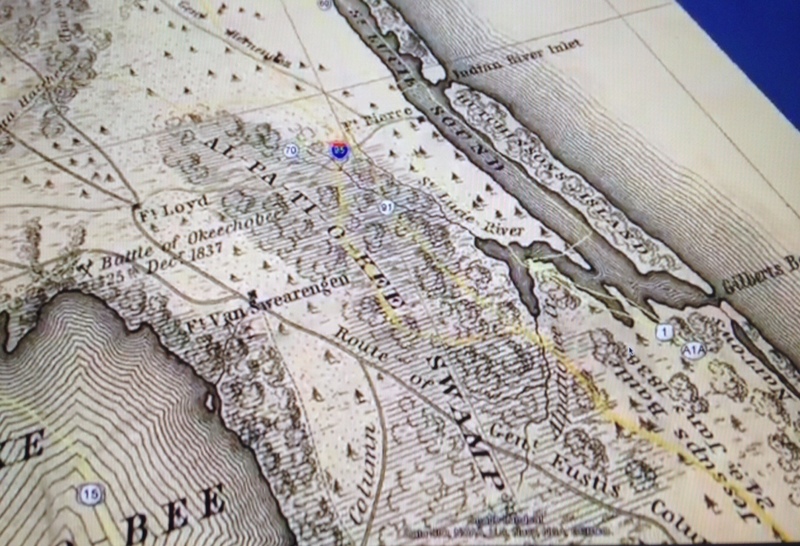 THE OLD MAPS: The old maps are not necessarily accurate, but they give an idea… They show basically what was known as the “Hal-pa-ti-o-kee Swamp.” On some other maps it is labeled the “Al-pa-ti-o-kee Swamp.” On almost all old maps, it would cover the area that is labeled Allapattah Flats on the modern topographical maps — but Hal-pa-ti-o-kee was probably more to the east. 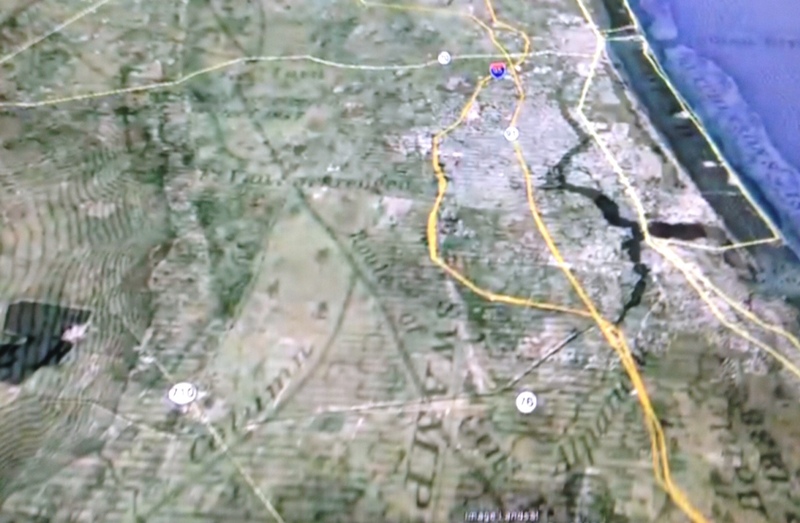 Google Earth image 2015, Todd Thurlow. TOPOGRAPHY AND RIDGES: There are two distinct ridges in western Martin County. 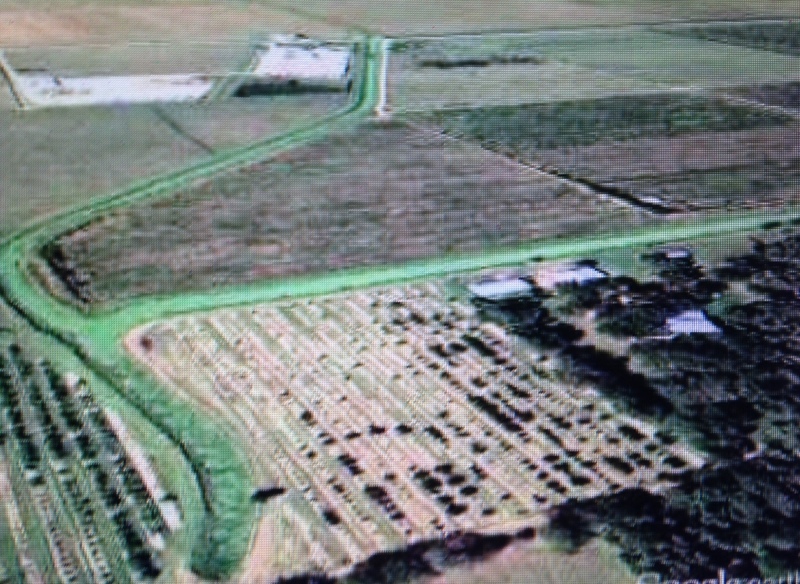 Green Ridge is about 4.6 miles west of the turnpike, (12.5 miles west of the ocean), and can be seen on aerials. The western edge of Allapattah flats is a ridge where the elevation goes quickly from about 30 fee to 40 feet. This ridge (an obvious ancient ocean shoreline) can be seen running all the way to Cape Canaveral parallel to the coast. This ridge is about 12.5 miles west of the turnpike (20 miles from the ocean). Indiantown sits on the high side of the ridge. This Hal-pa-ti-o-kee Swamp on those old maps would be the we area east of the Indiantown ridge – so it is basically all of western Martin and St. Lucie County. ….Somewhere between the St. Johns and the St. Lucie so everything between the two ridges, but north of that point, went north to the St. Johns River. Everything south would have gotten picked up by Ten-mile creek in the extreme North Fork of the St. Lucie River, which actually flowed north-east before turning back south to the St. Lucie. It is human nature to “miss something once it’s gone.” This is true whether it’s the St Lucie River/Indian River Lagoon, or something else. The plane provides a great “overview” flying 1500 feet or much higher, and can cover long distances quickly. Thank you to my husband for providing this trip, this farewell…In fact thank you to my husband for all of this. If it were not for him, the river would not be documented as it is! It was actually this plane, the Cessna 340, that took the first photo on June 28th of 2013, during the toxic Lost Summer, that inspired me to start taking photos of the river and discharges regularly. 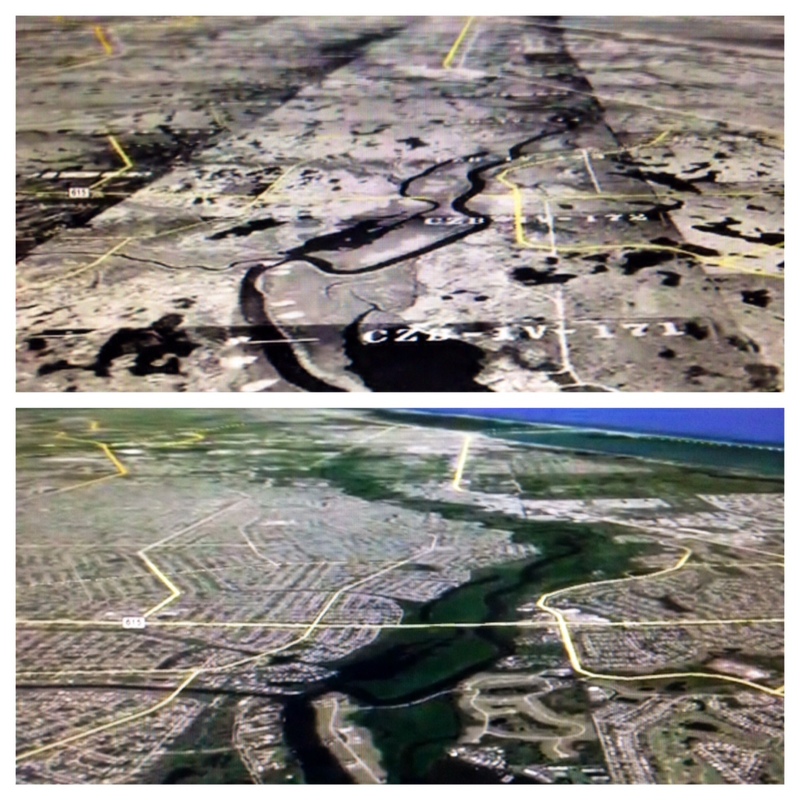 As you can see below, this photo was/is so alarming, showing the impact and damage caused to property values and the environment by the releases from area canals and by Lake Okeechobee. 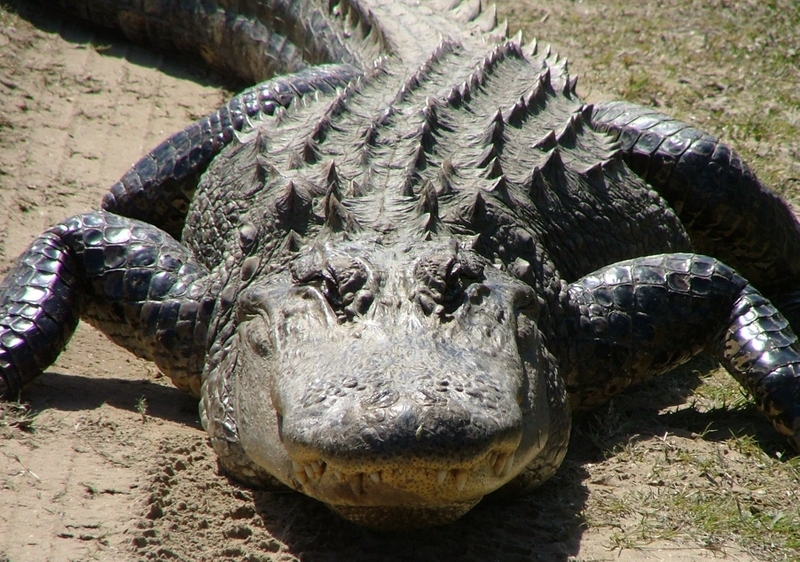 Lake Okeechobee always the nail in the coffin…. 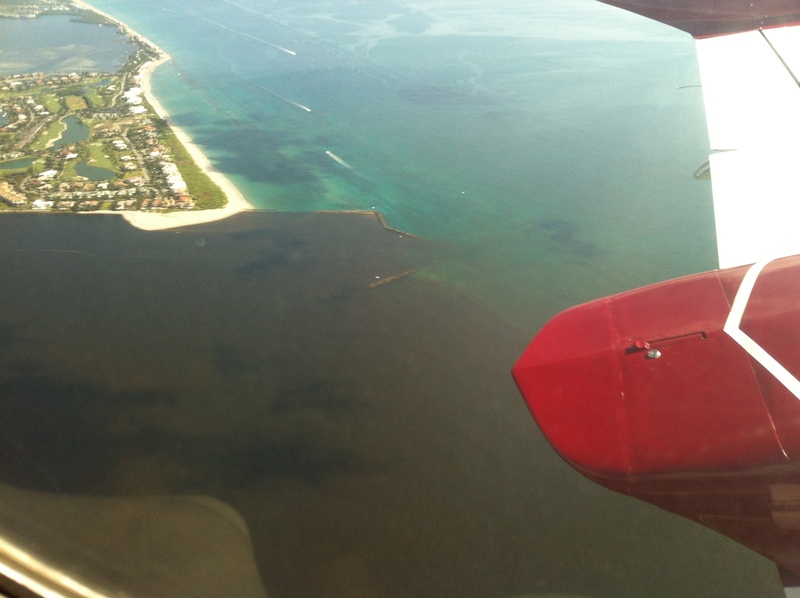 Cessna 340 June 28th 2013 photo showing plume from area canals and Lake Okeechobee exiting St Lucie Inlet. Hand drawn map of flight path over option land map. 2015, JTL. So today, I am going to provide the farewell videos I took, and one other You Tube video I finally published so that if you ever want to, you can see for yourself what it looks like to fly from Stuart over the St Lucie River and C-44 canal, around the south rim of the “ocean of water” known as Lake Okeechobee, and then along the lake’s rim passing areas/cities of Pahokee, Bell Glade, and South Bay, then turning south along the New River Canal, flying through the sugarcane fields, (the Everglades Agricultural Area), until finally seeing the water conservation area/s, and Alligator Alley (even though I think I mistakenly say Tamiami Trial in the video….) and then flying back up the Miami canal to Clewiston before I stopped filming due to turbulence. The videos are raw footage. Nothing fancy, the reality of a low plane ride. Many try to convince me to make them more professional. I like them as they are. Real. They show the view, the conversations, the thoughts, the heat, the noise, the turbulence….the miracle of being above ground! 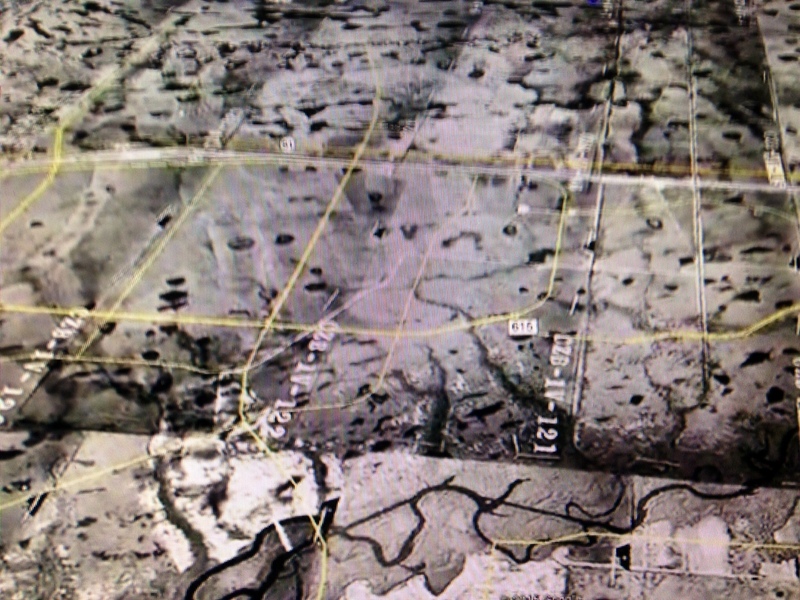 The videos are split into 5 parts covering most of the trip and I included one other at the end that was taken in 2014 by Ed with a Go-Pro as it shows clearly the US Sugar option lands that are now being so hotly debated for Everglades restoration and purchase with Amendment 1 monies. To use another cliché, “seeing is believing.” Yes, see, believe, and know, that we are changing our world. Some of these boggy ponds were right outside my neighborhood in St Lucie Estates, just off of East Ocean Boulevard. It was the 1960s and 70s. Over time, especially in the 80s and 90s, when I had grown up and was off to University of Florida and beyond, these ponds simply dried up and “disappeared.” These lands became shopping centers, an expanded Witham Field, gas stations, schools, golf courses, and more neighborhoods. The same thing happened to the lands out west of town, but they became expanded agricultural lands. At a kid, I didn’t think too much about it. Today it blows my mind. The aerial at the top of this blog post is from 1940. I was born in 1964. The small dark areas are ponds. When I asked my brother Todd, who is very knowledgeable on these old photos and land use, where all the ponds went, he noted that when our area canals were constructed by the water districts and Army Corp of Engineers, from about 1920 to the 1960s, the canals not only drained the lands, but over time, the water table dropped, (the water below the surface of the soil that you don’t see) drying out the many of little ponds, so that these lands could be developed. Canals in Martin and St Lucie counties, C-23, C-24, C-25 were constructed in the 50s and 60s. 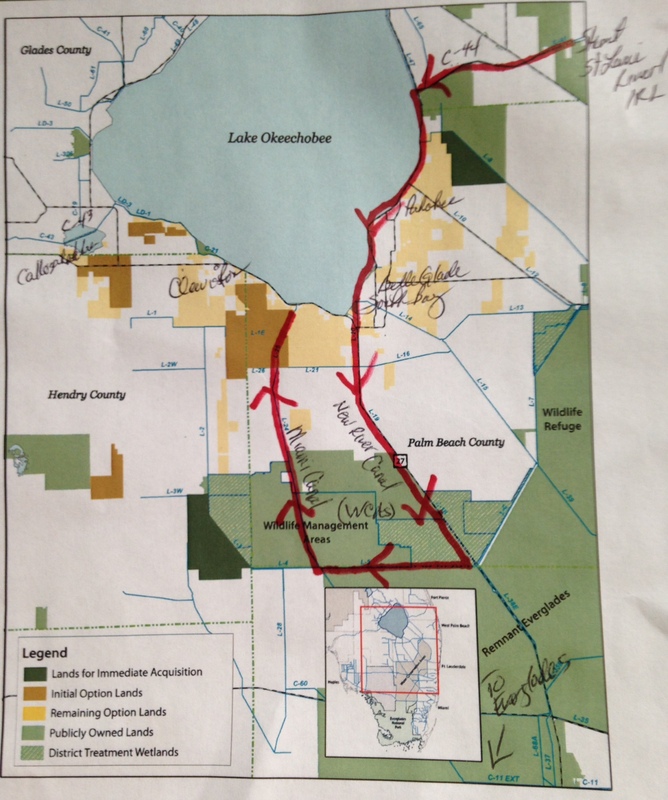 C-44 is connected to Lake Okeechobee but also drains the agricultural lands around it. It was constructed in the 1920s. 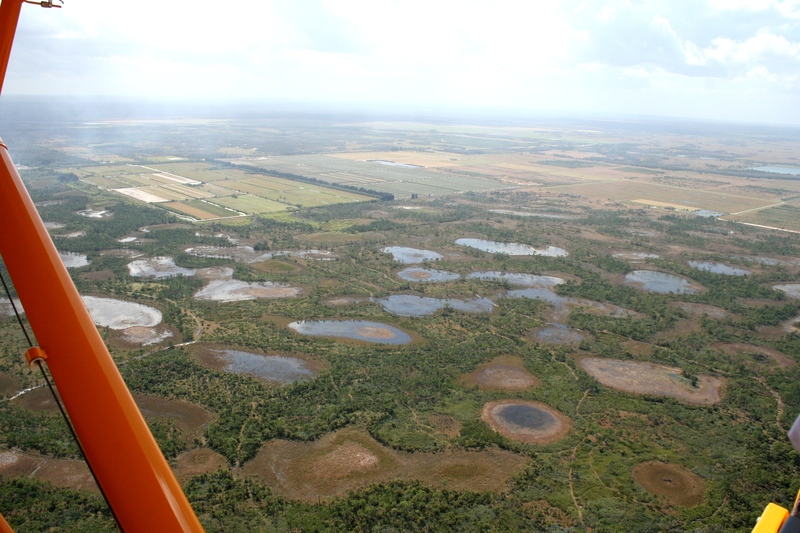 So most of the 1940 wetlands you see in the aerials throughout this blog are now gone, and “we are here.” This happened all over Martin, St Lucie and almost all counties of south Florida. This on top of the shrinkage and drainage of giant Lake Okeechobee! 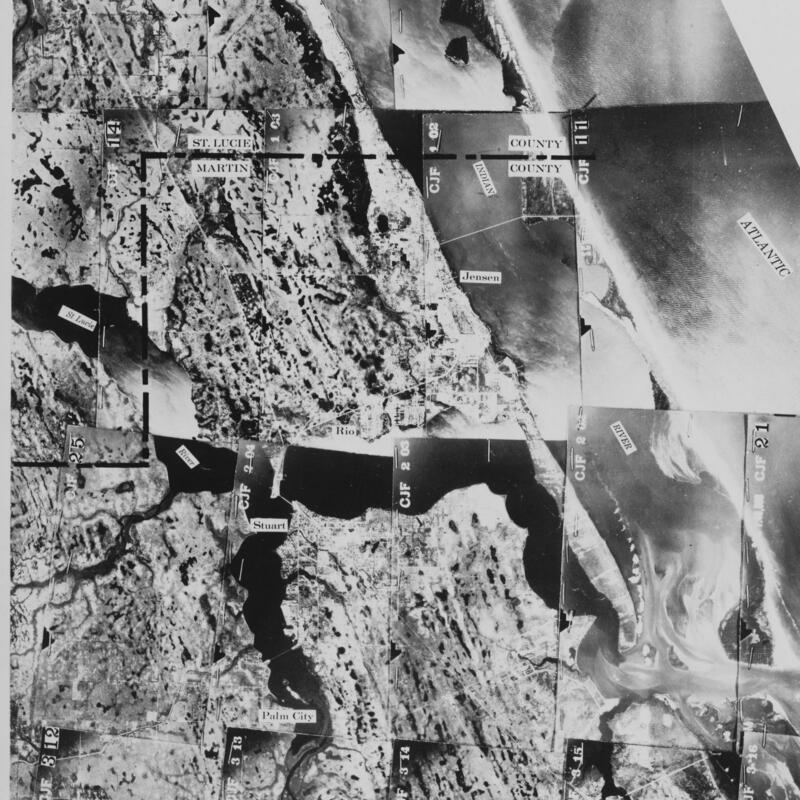 1940 DOA image of border between Martin and St Lucie Counties, where Port St Lucie sits today. 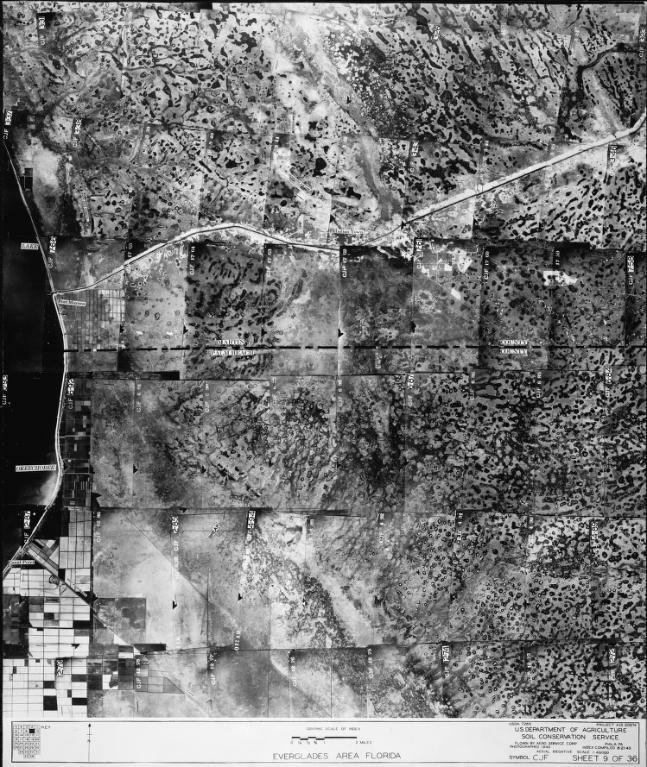 1940 aerial of east side of east side of Lake Okeechobee and lands of western Martin and St Lucie counties. 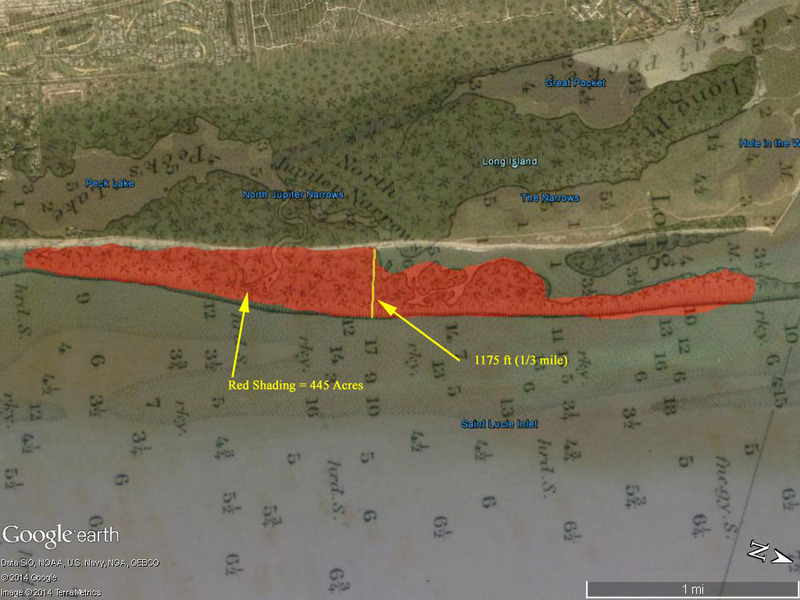 Comparison of 1947 USGS map/and Google Earth aerial 2014–Shows natural inlet break 1.1 miles south of St Lucie Inlet in 1947 and how much Jupiter Island has migrated towards the coast since then. In a world that is constantly in flux, it is natural to try to make things permanent. Nonetheless, this is to no avail. Nowhere is this as strikingly apparent as our barrier islands off the U.S. Atlantic coastline, right here at home, along our beautiful Indian River Lagoon. My brother, Todd Thurlow, (http://thurlowpa.com) has finalized his Time Capsule Flight video of “The Inlets of Peck’s Lake and the Jupiter Narrows,” that I first shared with you in “trial version” last week. His result is even more remarkable. Through the overlay of Google Earth, historic aerial photographs, NOAA, and USGS maps, his work provides a look back in history to see that our coastline south of today’s St Lucie Inlet has broken through at least four times to form four natural inlets since 1947. They are: 1947 (1.1 mile south); 1952 (0.5 miles south); 1958 (1.1 south again or another in close proximity; and 1962 at Peck’s Lake during the famous Ash Wed storm. I find these “visions” absolutely beautiful. Nonetheless, it is cool to think about. Here is his map. According to Todd, the red polygon in the attached image measures 445 Acres – approximately the amount of land that disappeared between Peck’s Lake and the Inlet since the 1887 NOAA chart. The yellow line measures 1770 feet – a third of a mile. Shoreline loss close to Peck’s Lake since 1887 map. I am excited that Todd is sharing his “evolved” Thurlow map talents, and I am looking forward to a 2015 where he is a regular guest on my blog, taking us all to a high and fluid perspective where we can see change along the St Lucie River/Indian River Lagoon in a way never before.